A currently recognized barrier for the wider adoption and dissemination of Semantic Web technologies is the absence of suitable interfaces and tools to allow suitable access by end-users. In a wider context, it has also been recognized that modern day interfaces must deal with a large number of heterogeneity factors, such as varying user profiles and runtime hardware and software platforms. 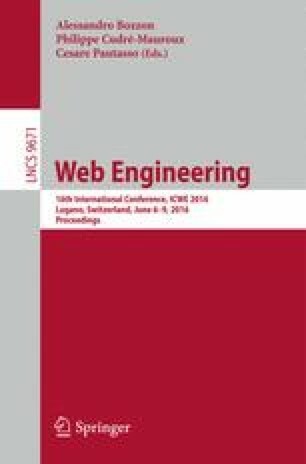 This paper presents MIRA, a framework for defining and implementing Semantic Interfaces for Web applications, including those on the Semantic Web. A Semantic Interface is defined as being one capable of understanding and adapting to the data it presents and captures, and its schema, if present. Moreover, the interface must also be able to adapt to its context of use – the device being used, any available information about its user, network conditions, and so on. Using a model-driven approach, MIRA allows developers to define such interfaces, and generates code that can run on clients, servers or both. We have carried out a qualitative evaluation that shows that MIRA does indeed provide a better process for developers, without imposing any significant performance overhead. D. Schwabe was partially supported by CNPq (WebScience INCT proj. 557.128/2009-9). E. Bertti was partially supported by a grant from NIC.br and the W3C Office Brazil. This work also had partial support from the Microsoft Open Source Initiative.